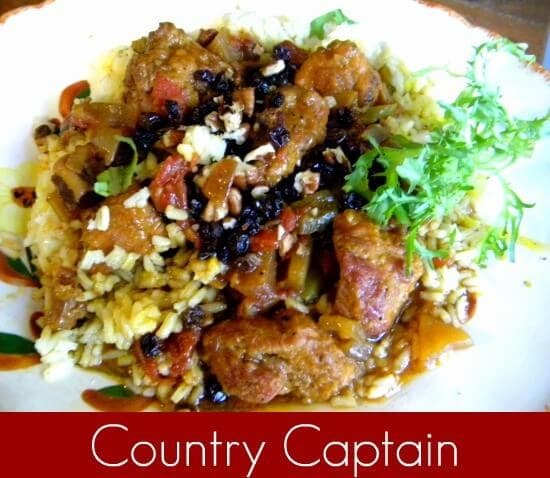 Country Captain Chicken is a traditional chicken stew that found it’s way into southern cuisine in the late 1800s.. Its warm Indian flavors, combined with the knack southerners have for squeezing the flavor out of each ingredient, have made this easy slow cooker chicken recipe a favorite for generations. I love old recipes. I like finding them in the vintage cookbooks I adore…especially if they are handwritten in the fly leaf. Country Captain Chicken is one of these. There just aren’t many people that don’t love it once they taste it – an old, old recipe for a chicken curry type dish that has been popular in the Deep South for over 150 years. What I wanted to see was if I could make it work in a slow cooker and if I could spice it up just a little. I started with a recipe that I had seen in Saveur. I used chicken breast. I realize that using whole chicken cut up will add more flavor because of the bones but I rarely buy anything but chicken breast. My family eats chicken breast really well… sometimes other parts not so much. You can use a whole chicken, cut up or chicken thighs if you don’t want to use chicken breast. 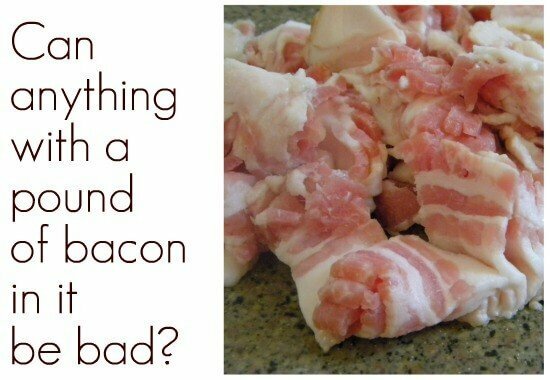 I also used, yes, a full pound of bacon. The smoky flavor meshed well and because I was using chicken breast the extra fat was a good thing. I also added a little jalapeno for bite. In retrospect I think chipotle would have been better and I will do that next time. The flavors here are warm and fresh, exotic and comforting all at the same time. It is a nice introduction to curry flavor for those that have not had it before. I used my crockpot. It just made it simple and kept the kitchen cool. Before the chicken went into the crockpot I dredged it in flour and sauteed it in the bacon fat. This gave it a great color and flavor that held throughout the cooking time. I really think it was an important step. You want to serve this with rice or even couscous. The meat is tender and the vegetables slump together in a melange of warm camaraderie. A sprinkle of toasted pecans on the top of each serving adds nice texture and a little flavor boost. I made my 6 qt crockpot full – but don’t worry… it freezes great! A sweet and spicy chicken curry that is simple to make in a crock pot. 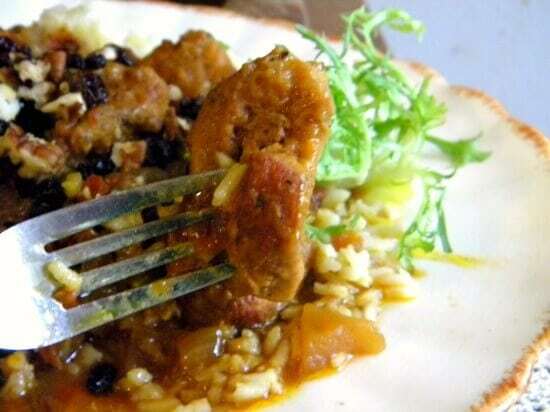 This recipes serves a crowd - you'll need a 6 qt slow cooker to make the recipe. It will feed 16 -20 people. Dredge the chicken in the flour and shake off excess. Sear the chicken in the hot bacon fat until golden on each side, but not cooked through. Saute the onions, celery, apples, and peppers in the same pan until they begin to soften. Add garlic and saute for five more minutes. Pour the tomatoes into a crock pot. Add the curry, brown sugar, cinnamon, ginger, bay leaf, and butter. Add the bacon, cooked vegetables, currants and chicken and stir. To serve, spoon over rice. Sprinkle on toasted pecans and more currants. YUM!! This is going into my cookbook for sure!! Hope you like it Regina.